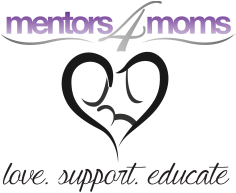 Mentors4Moms is a Christian-based mentoring program, for pregnant and parenting moms, that connects a new Mom with a Christian Mentor who will provide her with a loving and supportive friend who is there to assist her with challenges of raising a child. her with the friendship and guidance of a Christian Mentor. Founded by Jacquelyn Mendoza, the owner of San Diego Destination Weddings, Mentors4Moms matches pregnant and new Moms with a Mentor who maintains weekly contact her to guide and support her with raising her child. Mentors provide parenting advice and biblical counsel that will empower Moms and enable them to provide the best possible loving care and direction to encourage the development of a healthy, well balanced child. Mentors do this by sharing their lives with the moms and being there as a friend and giving her the message of God's love, mercy and forgiveness through the Gospel of Jesus Christ! Mentors4Moms offers several programs that are easy and fun that will provide our young Moms with Early Childhood Education, Child Development and Parenting Skills that she needs. San Diego Destination Weddings offers an easy way for you, as a couple, to help Mentors4Moms. Give your guests an opportunity to donate, by simply placing donation cards on your gift table. Ask your coordinator for more information!